Duelist Pack: Legend Duelist will be released this upcoming weekend on 3rd June 2017. In it contains, among many others, cards used by Bastion Misawa (三沢大地) from the Yu-Gi-Oh Gx anime. It would also mark the first support released to the “Bonding” archetype. Today, I am here to remind everyone of a character from the Yu-Gi-Oh Gx anime that you might not even remember. The user of Water Dragon and the first rival of protagonist Jaden Yuki, “second best” in Duel Academy – Bastion Misawa. An intelligent individual, Bastion Misawa can be considered to be the Antithesis of the series protagonist. While Jaden Yuki is talented in his skills and goes with the flow, Bastion has shown to rely on hard work, calculations and mathematical probabilities to secure a victory. Bastion debuted in the anime’s pilot episode. He was mentioned to have the best score for the written exam. For his practical exam, via Ring of Destruction, he bypassed his opponent’s tough defences, passing the secondary part of the exam as well. The choice to destroy his own monster Vorse Raider was also shown to be clearly planned out, as Bastion executed it calmly without hesitation. All these traits established the character’s calm personality and high intellect. He was also shown to be polite, thanking his examiner after his victory. An exchange he had with Jaden after the exam surprised Bastion when Jaden referred to him as the “second best”. Curious, Bastion enquired why, to which Jaden responded confidently that it was because Jaden himself would be first. In his debut episode, Bastion displayed a broad knowledge of card effects, understanding Crowler’s play involving Statue of the Wicked, the piercing effect that Ancient Gear Golem has and Jaden’s Elemental HERO Flame Wingman‘s effect. After Jaden’s duel, Bastion noted to himself that Jaden might make a fine rival, addressing him as “ichiban-kun”, indicating that he might agree with Jaden’s self-proclaimed title. Upon entrance into Duel Academia, Bastion Misawa was granted the Ra Yellow dorm for his impressive entrance examination score. His friendship and rivalry with Jaden deepened after their encounter during a baseball game. Bastion emerged as a relief pitcher and managed to strike Jaden out with exactly three pitches, backing his claim that his calculations would allow him to strike Jaden out with ease. True enough, Jaden did not even manage to graze the ball with his bat. In baseball terminology, this is considered to be impressive as Jaden was not able to make contact. When it was Jaden’s turn to pitch and Bastion’s to bat, the latter displayed impressive batting skills to compliment his pitching skill. Bastion managed to hit a home run, putting Jaden’s pitching skills to shame. A further conversation would reveal that Bastion indeed scribbled equations on his baseball bat and varied his pitches with statistics and mathematical probability, arming himself with calculations during the course of the game. A trip to Bastion’s dorm room would also reveal his walls and ceiling are wallpapered with equations and numbers. Among those, Schrödinger’s Cat and Avogadro’s Law equations were also present in the original. The episode also revealed many similarities between Jaden and Bastion, such as when they were shown snoring similarly in their sleep. The prelude to his promotion exam also revealed another eccentric aspect of Bastion. When he lost his deck after Chazz Princeton discarded it into the sea, he revealed that he kept six different attribute decks under his jacket. After Bastion won Chazz Princeton, he was offered admission into the Obelisk Blue dorm, but firmly turned it down, mentioning that he can’t promote to Obelisk Blue knowing that he wasn’t the first among his cohort. This would once again indicate Bastion’s agreement that he was indeed second to Jaden. An eager Jaden proposed a duel immediately but was declined by Bastion who commented that he needed a seventh deck to defeat Jaden. His determination to defeat Jaden was made evident when he revealed that the six decks were prototypes made to study Jaden’s Elemental HERO deck. On that note, Bastion’s victory also demonstrated his duelling capabilities as he was able to defeat the Obelisk Blue Chazz Princeton with a prototype deck. The opportunity for the two rivals to clash presented itself when Duel Academy required a representative in their inter-school battle against North Academy. Jaden initially gained the upper hand in the duel, but the tides turned when Bastion summoned out his Water Dragon to bait Jaden to answer with Polymerization. With that, Bastion was able to negate the Fusion spell with Cursed Seal of the Forbidden, barring Jaden from using that card for the duel, sealing off his Fusion monsters. Having crippled Jaden’s deck with the Counter Trap card, Bastion began his counterattack, tearing through Jaden’s defences. Calculations? Things like this don’t matter to me. Challenging Misawa’s clear and concise calculations, Jaden asserted his stand, claiming that calculations do not matter and that he would prevail as long as he is persistent enough to win. Relying on supporting Spell Cards, Jaden brought out Elemental HERO Bladeage onto the field, remarking that Bastion made a grave error in assuming that Fusion is the only heart of his HERO deck. With the help of his iconic Field Spell Card Skyscraper, Jaden was able to take down Water Dragon, placing Misawa in a precarious situation. Undeterred, Misawa followed up with a Ritual Summon of Swordsman Of Doom Lithmus. Ultimately though, Jaden was able to attain victory via Element HERO Wildheart and its Equip Spell Cyclone Boomerang. With the unorthodox method of launching into a suicidal battle in order to trigger Cyclone Boomerang‘s effect upon destruction, Jaden wiped out the remainder of Misawa’s 500LP. Despite losing, Bastion expressed satisfaction at the duel, promising the creation of an eighth deck that would surpass Jaden someday. In this duel against Jaden, cards played by Bastion, such as Mathematician and Carboneddon, would see a release in the OCG nearly a decade later from the episode. Bastion’s next duel would involve the Shadow Rider Tania. Distracted by a crush towards his opponent, the Ra-Yellow student would suffer a humiliating defeat, forfeiting the Spirit Key that he was tasked to guard. The loss and unrequited love spiralled Misawa into a slump, as it was revealed in flashbacks that he lost to Tania with all six decks he owned. Comically, the once level-headed character is shown to be heartbroken and lovesick, pouring strawberry jam onto his omelette rice and drinking Tabasco sauce as a beverage. While not explicitly mentioned, Jaden’s victory over Tania was implied to have returned Bastion back to normal, coupled with the shock that he received when it was revealed that Tania was a tiger. Unfortunately, Bastion was absent in the group’s future battles against other Shadow Riders, such as Abidos The Third, Don Zaloog and Titan. He would reappear alongside the main cast to celebrate Duel Academy’s annual school festival, cosplaying as Amazoness Tiger, seemingly as a tribute to Tania. Arriving late due to spending too much time preparing for his cosplay, he spectated the duel between Dark Magician Girl and Jaden. He would later be present among the main cast when they confronted Kagemaru, attempting but failing to challenge the founder and former chairman of Duel Academy. Season 2 would mark the start of Bastion’s downfall, as he participated in most duels only as a spectator. His first duel of the season would be a short one, showing his loss to Jaden. The majority of the duel were off-screen, but Water Dragon was shown to have lost against Elemental HERO Shining Flare Wingman. Upon his loss, he commented that Jaden has indeed polished his skills after the latter duelled Zane during the Graduation Match. In the duel between Zane and Aster, he displayed a wide knowledge of Elemental HERO Fusions, even sharing with his peers on how the same fusion materials can result in a different Fusion Monster, explaining Elemental HERO Phoenix Enforcer‘s presence. This knowledge could have originated from his excessive study of Jaden’s deck. Similarly to the rest, he was shocked as his upperclassman’s defeat at the hands of Aster Pheonix. Bastion researched Aster when Jaden was revealed to be Aster’s next opponent, but it turned out to be a fruitless attempt to uncover any new information. As a spectator, he was impressed with the power of Aster’s newly-revealed Destiny HEROes. When Jaden was defeated, he was visibly shocked and concerned as he witnessed Aster defeating another friend of his. As the Society of Light begun to recruit members, Bastion’s dormmates exited the Ra Yellow dorm one by one, leaving him as the only inhabitant. With his pride wounded and determined to show his worth, he challenged Satarious to a duel but was met with Chazz instead. Throughout the duel, he displayed the best of his abilities, even impressing Satarious enough for the villain to consider him a threat. Unfortunately, as Satarious orchestrated, the lonely and frail Bastion would give in to temptations and forfeit the duel, opting to not activate his prepared Trap Card. With that, Bastion joined the Society of Light. Sadly for the former top Ra-Yellow student, even as a member of the Society of Light, he failed to gained recognition and was sidelined more as the series progresses. Spectating yet another duel, this time involving his idolised Dr Eisenstein and rival Jaden, Bastion got inspired and tossed aside the Society of Light (quite literally), deciding to follow Dr Eisenstein as an apprentice. Missing from the next few dozen episodes, Bastion returned, barely recognisable. It was then explained that he went on to assist Dr Eisenstein in quantum mechanics at his lab upon leaving the Society of Light. There, an experiment went wrong which brought him to the Dimension World, where he reunites with Duel Academy. From his conversation with Jaden, he seemed quite traumatised and agitated, likely caused by the presumed weeks of wandering the desert. Misawa contributed to the group’s return with his mind, scribbling equations in an attempt to figure a way back to the original world. His eccentricity has shown to return, as scribbled equations were visible on a bread that he had. Helping establish contact with Dr Eisenstein, Bastion was able to set up the inter-dimensional duel between Jesse and Zane. Deducing the Three Sacred Beast as the viable method to awakened Rainbow Dragon, he gallantly defended Jaden and Jesse against the Duel Ghouls as the duo made their way towards Yubel. With that, Water Dragon reappeared, putting an end to its 45-episode absence. Despite Water Dragon being destroyed ultimately, he bought the duo enough time to reach their respective destinations, setting the plan to escape this dreaded dimension into motion. After the entire school returned to Duel Academia, Bastion and Dr Eisenstein spotted an anomaly and went to inform everyone of the reopened door to another dimension. Despite initially advising against returning through the wormhole, he suggested and supported the idea, summoning Water Dragon to contribute to the duel energy in order to expand the wormhole. Immersed in his calculations upon arriving the new dimension, Bastion fell through a hole and got reunited with none other than his old crush – Tania, who was also dragged into this dimension. After saving a group of weak monsters from the tyranny of Winged-Beast monsters, Bastion chose to stay alongside Tania. While he insisted it was due to his curiosity of the mystery of this world, it was likely that his crush on her still lingers. Misawa returns after Jaden’s entire ordeal as the Supreme King, having figured out the mysteries of the world. Bastion explained Yubel’s plan to unite the twelve dimensions, citing that the only way for Jaden to win is to embrace his Supreme King persona. As a spectator, he noticed how frail Zane Truesdale has become when Zane duelled the Yubel-possessed Jesse. After Zane collapsed, Bastion rushed to his aid along with the others, reassuring his senior that Jaden’s fighting spirit would definitely be re-ignited after Zane’s display of determination and willpower. When Zane met with his demise, Bastion, too, shed tears at his tragic death. He did not accompany Jaden in the latter’s pursuit for Yubel, instead opting to remain with Tania and her comrades, quoting that they required his help and he wishes to respond. It is comforting that the once insecure and lost student has finally found purpose with his life. Volunteering to bury Zane’s Duel Disk, Bastion bid his former rival goodbye, leaving him with words of encouragement and a handshake. Bastion did not appear in Season 4, leaving his fate unknown. While not explicitly mentioned, it is presumed that like many others, Bastion got sucked into the “World of Darkness” by Nightshroud despite residing in an alternate dimension. In the “World of Darkness”, a silhouette bearing a strong resemblance to Bastion can be seen. While it was neither confirmed nor denied, Bastion would have been freed when Jaden defeated the villain. Despite Misawa’s personality and traits, he is not without his shortcomings. He personally admitted that it was careless of him to leave his deck by his desk when his room was being painted. This left Chazz with the opportunity to steal and discard the deck. Bastion has, at times, shown to have a crush on cards depicting cute females, but is reluctant to admit it. It is likely that this distraction contributed to his loss against Tania. Bastion’s insecurity and desire to be recognised also led to his downfall, something which Satarious successfully exploited to lure him into the Society of Light. In the game based on the anime’s first series, Bastion had plenty of storylines and scenes which parallel the anime. 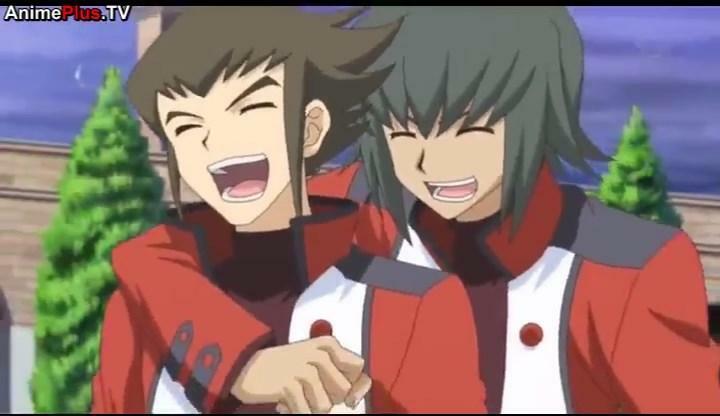 These include his duels with Chazz Princeton and Jaden Yuki. Dialogues would largely remain the same. To reference the claim he made in the anime of having six decks, Bastion would indeed have six different decks that the NPC pilots in the game, one for each attribute. They were named Stirless Earth, Brilliant Radiance, Water of Tranquillity, Allegro Airs, Invasion of Flames and Pitch Darkness. Misawa is also shown to participate a strict training schedule in the game, involving early morning card drawing practices. Due to changes in game mechanics, Bastion did not receive any unique storyline in this game. However, an event at the Abandoned Dorm has him partnered with Axel to duel the player. In the third instalment of the Yu-Gi-Oh Tag Force series, Bastion Misawa received a more fitting ending to his character arc. The game is loosely based on the fourth season of the Yu-Gi-Oh Gx anime. In this timeline, Bastion did not stay in the alternate dimension and instead returned with the rest of his schoolmates. The storyline carried on from the student’s return from the alternate dimension, and Bastion lamenting on how plenty of his peers were unaware of his return. Friends and classmates oblivious to his presence were also a recurring theme in the game. For the final event of Bastion’s gameplay, Bastion managed to fight his way (together with the Player) to the finals of the climatic Graduation Tag Duel match. However, his opponents for the finals were not his rivals, as he initially expected, but were instead minor characters. The audience were more interested in the other duels instead of the finals. Both the lack of audience and the underwhelming opponents made Bastion felt that his victory was hollow and disappointing. A conversation between Axel Brodie and Bastion Misawa after the duel made the latter realise that he didn’t need to be in the spotlight to shine. The image unlocked from the gameplay featured Bastion lying on the grass alongside the Player, away from the other main characters which were grouped together. With that quote, Bastion’s storyline ends, leaving closure for fans like myself who were unable to witness this moment unfold in the anime. Hilariously, as a parody of Jaden Yuki, Bastion Misawa has an alternate version that can be unlocked after completing the original Bastion Misawa’s gameplay. Dubbed “Excited Bastion Misawa” by fans, this version’s gameplay would alter the history of events, placing him in the protagonist’s situation where he arrives to save the day. Contrary to how he was initially portrayed in other medias, this version of Bastion would attract too much attention instead. To further highlight this point, Excited Bastion Misawa would be piloting Jaden’s HERO deck. Plenty of his gameplay is a replicated but modified version of events from Jaden’s. Bastion commenting on Jaden’s ability to draw a useful card in times of need. Bastion in the manga appears as a supporting character with a more satisfying development, whose role did not diminish with time as he did in the anime. The greatest difference between both counterparts is his existing crush on Alexis Rhodes in the manga, something that was absent in the anime but was referenced to in the Tag Force game series (where Bastion would be shown to blush in the presence of Alexis Rhodes). Instead of Jaden, Bastion’s rivalry was directed more towards Chazz Princeton initially. From flashbacks, it was revealed that he lost to Chazz plenty of times in tournaments before the two became schoolmates in Duel Academy. His respect from Chazz also stems from these losses he suffered. After Chazz lost to Jaden, Bastion set his sights on the Slifer Red student, commenting on how he regarded Jaden as a genius for his skills in changing the game state with a single draw. His rivalry with Jaden originated from Bastion’s envy towards his duelling skills, and later, the fact that Jaden had his crush’s phone number and he did not. He was referred to a prodigy by Alexis Rhodes, indicating the resemblance in intellect to his anime counterpart. His duelling capabilities were also alluded to when he was mentioned to have the “Number 1 Ra Yellow Student” title, suggesting plenty off-screen victories under his belt. His style remains to be an analytic approach, going as far as to (correctly) predict and deduce the identity of the cards in the opponent’s hand and backrow. Unfortunately for Misawa though, his every attempt to best his rivals failed, as he lost his duels to both Jaden and Chazz. Paralleling the “World of Darkness” situation in the anime, the manga had characters died as a result of Shadow Duels. Bastion suffered his demise at the hands of James Crocodile Cook but was revived when Jaden and Chazz defeated the ‘Big Bad’ – Tragoedia. Yu-Gi-Oh GX has received praises for character development, from turning the meek and shy Syrus Truesdale into a confident duelist, showing flaws and failures of the perfect Zane Truesdale and humbling the once prideful and arrogant Chazz Princeton. Unfortunately, it did not do Bastion Misawa much justice. As if to display the frustration of being ignored that Bastion felt, his presence in the anime faded drastically over time. Bastion went from a rival with a strong presence, to a comic relief in Season 2, being responsible only for plot progression in Season 3, where he is finally absent in Season 4. Bastion was shown to have a “Fire Dragon” alongside his Water Dragon in the first Gx opening – Fine Weather Rising Hallelujah. To this day, “Fire Dragon” has yet to be revealed, named only by fans due to its appearance. This may be a strong indicator that Bastion had a bigger role than what he ended up as. Having a Carbondeddon might also hint that a “Bonding CO2′ card was a possible idea to summon the said “Fire Dragon”. Out of the many decks that Bastion created, the WIND, FIRE, LIGHT and DARK deck were absent from the anime. Additionally, the promise of the eighth deck to defeat Jaden remained unfulfilled. Yu-Gi-Oh Gx has no shortage of rivals. The first season introduced Zane Truesdale and Chazz Princeton on top of Bastion as rivals, with Aster Phoenix and Tyranno Hassleberry added to the cast of characters in the second season. With more and more rival characters introduced, Bastion slowly fell into obscurity and oblivion. It was indeed a disappointment, seeing how the character acted as a foil to the main protagonist, piloting analytic calculations and hard work against raw pure talent. It remains my stance that this character was underutilised. As revealed in the Tag Force series games, Bastion possesses a dislike for fruits, with tomatoes being the only exception. However, he enjoys vegetable sandwiches. Bastion Misawa was voiced by Eric Stuart in the dubbed, who was also notable for voicing Seto Kaiba. Interestingly, Bastion used Ring of Destruction and Vorse Raider in his debut episode, both cards which were also owned by Kaiba. While it has been a known ongoing trend for lead protagonist to have an ace monster with 2500ATK, rivalling their main rival’s monster’s 3000ATK (Blue-Eyes White Dragon, Destiny End Dragoon, Armed Dragon Lvl 10, Red Dragon Archfiend, Galaxy-Eyes Photon Dragon, D/D/D Dragonbane King Beowulf), the tritagonist of respective anime series has been associated with monsters with 2800ATK. This may support the claim that with Water Dragon, Bastion’s signature card, fitting the trend, Bastion’s role in the anime was planned to be larger. Water Dragon‘s attack name in the original is Aqua Punisher, while the dubbed named it Tidal Blast instead. In Duelist Pack: Legend Duelist it received a reprint and an upgraded form – Water Dragon Cluster and a few support cards – Bonding D20, Bonding DH0 and Deuterion. Duelist Pack: Legend Duelist will also contain new support cards for “Red-Eyes”, “Roid”s and “Cyberdark”. There are also a couple of reprints of iconic cards from Duel Links. These includes Sphere Kuriboh, Wonder Balloons and The Golden Apples. Interestingly, Duelist Pack: Legend Duelist will also contain Amazoness cards, the archetype of female EARTH monster used by Bastion’s love interest, Tania. There are still other signature cards of Bastion that remains unreleased, such as his Swordsman Of Doom Lithmus and Conduction Warrior Linear Magnum ±. Fans can remain hopeful and patient. From a rival that bested Chazz Princeton and coming close to defeat Jaden, Bastion was unfortunately reduced to a plot device, served only to advance the storyline. While just purely my personal opinion, I felt that the franchise missed the perfect opportunity to bring Bastion Misawa back into the anime with the Chemical Beast archetype. He could have made a return in the Arc-V anime, alongside the other characters. Unfortunately, it would seem that Bastion is losing out in the popularity department to even get shortlisted for a return. What do you think about Bastion? Did you remember him or barely recognised him? Share your thoughts in the comments section below and while you are at it, who would you prefer to be featured for the next Character Spotlight article? This is Ken Sir and I thank you for reading this article. I would like Luca/Luna to be in the spotlight. She is a really good character. Thank you for the suggestion. Will keep that in mind and try to fulfil your request. Definitely remember him both in the manga and anime as I’ve never really played the tag force or other games. Everytime a card(s) of Bastion get printed, it’s a blast from the past that fills me with joy as I personally loved GX despite its flaws. I really like how you knew a lot about Bastion or Daichi in the original and want to say keep up the good work! As for character to be featured, I would like it if you continue from a duelist who’s cards are being released for this set, but if i had to choose I would say either cover Zane or Syrus. Also, here’s a glimpse at what may have been Bastion along with Zane in yugioh arc v.
It may just be a coincidence but this may be a joke in how Bastion may have been intended to appear even if it was at a lower class but I definitely could have imagine Bastion being in arc v if only that was the case. Well maybe in the arc v manga, there’s a chance we will see him if the writers decide to include past characters as they did in the anime. We’ll just have to see. Thanks for your compliment. I am a fan of the Tag Force series and felt that it added depth to the character more than the other video games did, hence the coverage on Tag Force. The article was written after a marathon of the Gx anime series and the re-reading the Manga. Like you, I am a fan of Gx. I have previously covered Zane on my personal blog when Power Wall was released. Will definitely be interested in doing a spotlight on Syrus since we have new Roid cards as well.